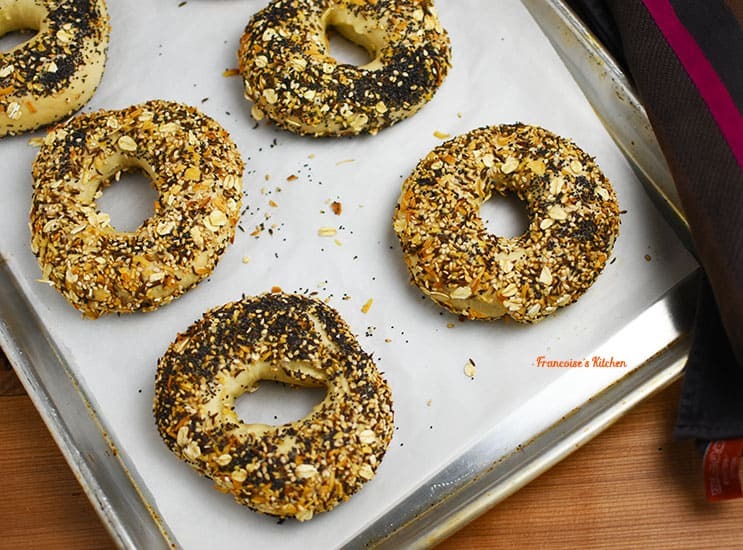 After making my Cranberry Bagels and Sesame Bagels for a while, one of my sons asked me if I could make him Everything Bagels. 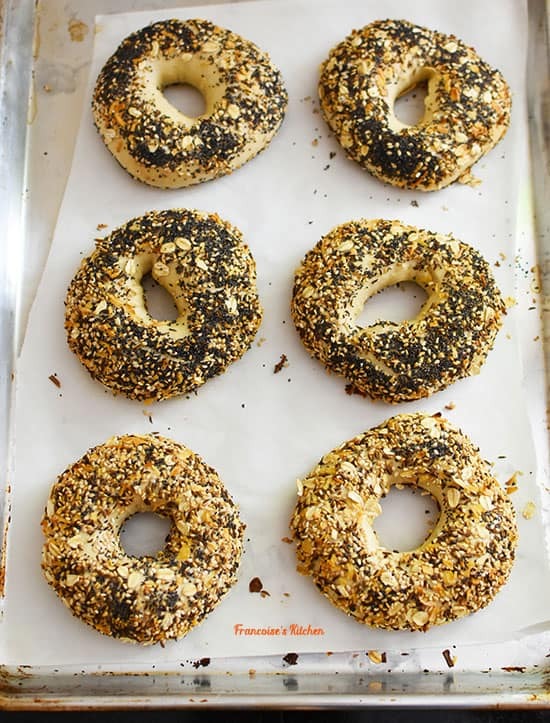 Everything Bagel seasoning is usually made of sesame seeds, poppy seeds, onions flakes, garlic flakes, and sea salt. I made my own seasoning and added some caraway seeds, oat flakes, and a little bit of “fleur de sel” (French sea salt). I made a few slight changes in the process compared to my initial recipes which makes it faster, all while keeping the same results. Combine 2 cups of warm filtered water, yeast, and 1 tbsp honey or brown sugar in a measuring cup. Let it rests for 5 minutes or until bubbles form on the surface. In the bowl of your stand mixer fitted with dough hook, add the flour, salt, and the yeast mixture. Mix dough at speed 1 for 4 minutes then increase the speed to 2 for 7 minutes or until the dough is smooth and elastic. Turn dough out onto a lightly floured surface and divide into 12 equal portions. Cover with a wet dishtowel and leave to rest for 15 minutes. Working with one portion at a time, shape each portion into a smooth ball. With your index finger make a hole in the center of each ball. 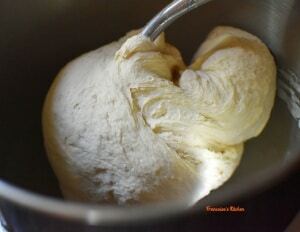 Using fingers of both hands, gently pull dough away from the center to make a 1 1/2-inch hole. Place bagels on a baking sheet with parchment paper. 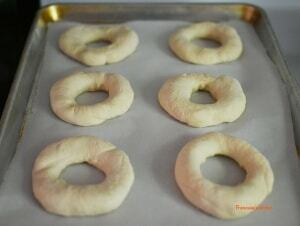 Cover with a wet dishtowel and let rise 30 minutes (bagels will rise only slightly). Place a heavy pan in the lower part of the oven and preheat to 450°. In a big saucepan or Dutch oven, combine 8 cups water, 1/2 tsp baking soda, and 1/4 cup brown sugar and bring to a boil. Gently lower, put 3 bagels into the saucepan. 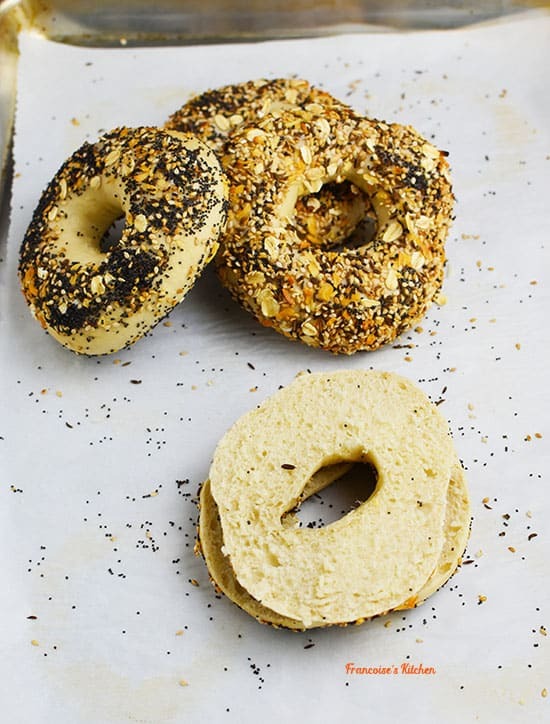 Cook for one side 1 min then flip the bagels and cook for another 1 min. Transfer the bagels to a wire rack set above the sink. 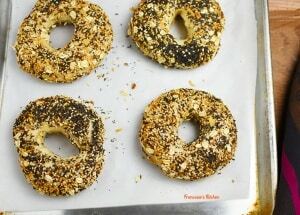 Repeat the procedure with remaining bagels, working in batches of 3. 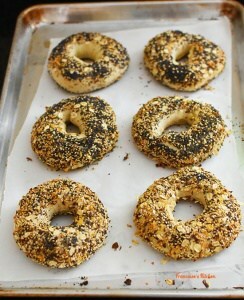 For topped bagels, put the everything seasoning mix in a plate, dunk into the boiled and drained bagels (both sides). 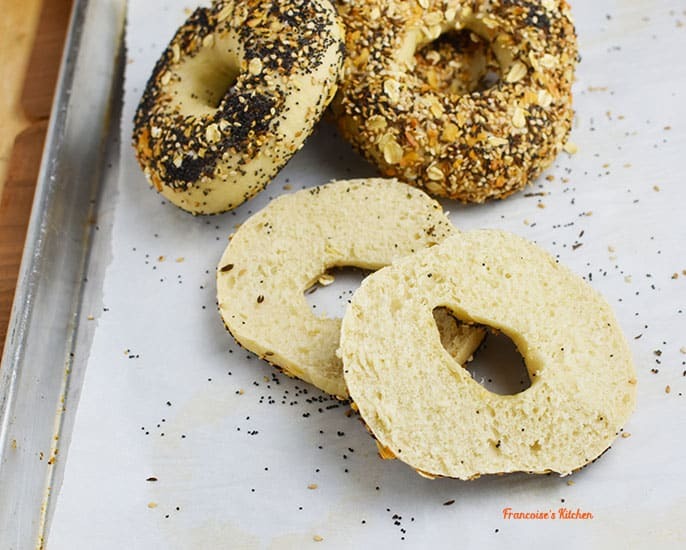 Divide the bagels between two baking sheets lined with parchment paper. Just before putting the bagels in the oven, pour some water in the heavy pan. Bake at 450° for 7 minutes. Rotate pans, add again some water in the heavy pan, and bake for 7 additional minutes or until golden. Cool on wire racks.